Obviously, sometimes you need to have brand new pallets, but a good pallet will last for years – and it can last even longer when you repair! Firstly, let us be clear, you shouldn’t undertake pallet repair yourself. Even though pallets seem simple, you should always leave pallet repair to the experts. If you use the wrong type of wood, the wrong size piece, or even put the nails in the wrong place your frankenstein pallet creation could be a recipe for disaster – not to mention the H&S nightmare! 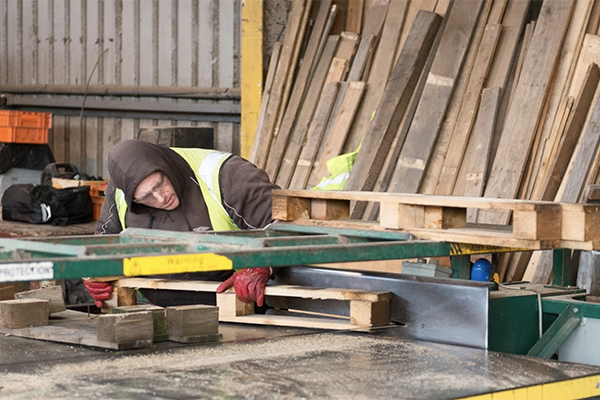 You should have your pallets booked in for repair with the experts because no broken pallet should be scrapped when it can be saved economically. Pallet repair by professionals can cost less than a new or even refurbished pallet. So with timber prices on the rise, unanswered Brexit concerns, and environmental impact at the forefront of business’ logistic concerns, repair could be the way to go! How Can Pallets Be Repaired? Obviously there are times when a pallet can’t be repaired, and in those cases we’ll advise you and recycle responsibly what’s left of your pallet. But in most cases where there’s a broken board, loose nails, or the usual wear and tear your pallet can be repaired by our team. We take new or second hand pieces and replace whatever your pallet needs to allow it to continue being of service. The cost of repairing a pallet will vary depending on the damage done, but it can be more cost-effective than buying a refurbished pallet. A good place to start is to ask us to make a site visit to have a look at your business operation and pallet usage. 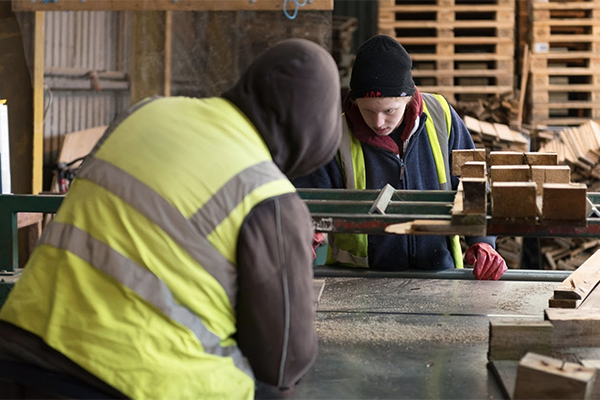 So why not consider whether our pallet repair and return service would benefit your business as part of our complete pallet management service. 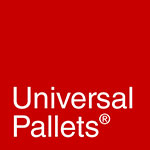 We offer new & refurbished pallets, repairing services, site clearance and recycling of pallets. So working with a pallet supply partner that can offer you a total pallet management service means that your business can be more efficient. In addition to the obvious cost savings, you’ll also be saving on your company’s carbon footprint, as your repaired pallets last longer and overall your pallets will spend less time and energy travelling to you. 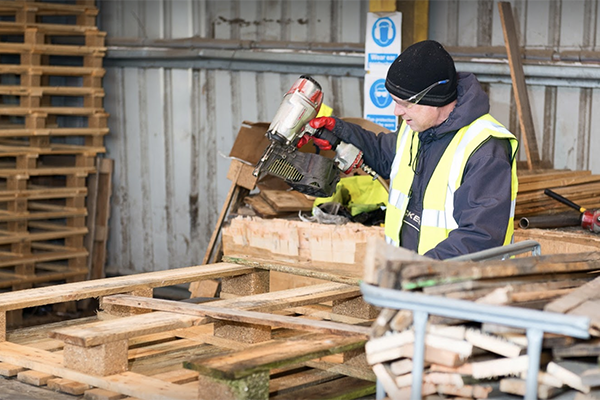 And if you’re currently throwing away your broken pallets to go to landfill you’ll be making a significant positive impact by using our repair and recycle scheme. There’s no need for broken pallets or broken pallet parts to go to landfill. We’ve partnered with the best local recycling companies to ensure any scrap pallet wood goes into animal bedding and biomass fuel. 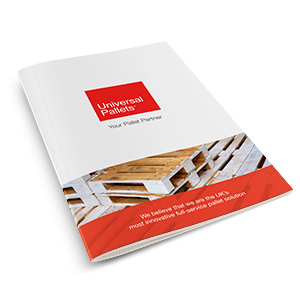 Plus the repair and recycle scheme offered by Universal Pallets represents a huge saving on the cost of a skip! 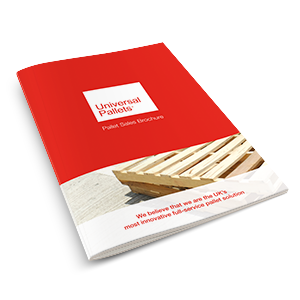 You can download our brochures and book a free, no-obligation site visit with our experts, or give us a call for a quick chat when convenient.